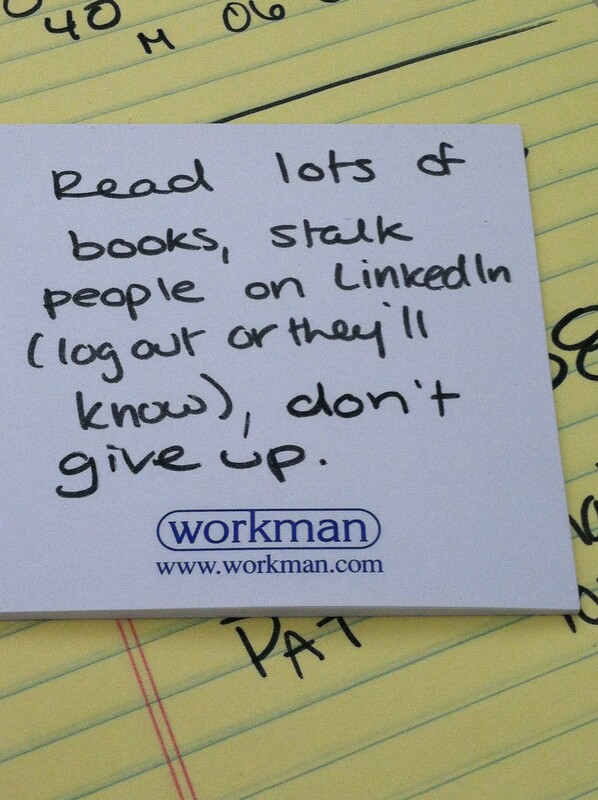 I totally use to log out of LinkedIn so I could spy on people's profiles in private too! My desire to work in publishing grew out of a love of books and kids and a fear of teaching. I’m sure any fellow English majors are constantly plagued with the “So… you’re going to teach?” question any time anyone finds out their major and wants to know their eventual career path. I was a camp counselor for four years and loved it, but didn’t want to go the teaching route, although I’m sure I’d love it if I did. So instead, I settled on publishing. Eventually, after fiddling around with my major and minors for awhile, I settled on an English major and Women’s Studies and History minors. I was pretty sure I wanted to work with books, but going to school in Boston is a lot more limiting in terms of internships in the book industry. I ended up interning at Teen Voices, a small non-profit magazine written for, by, and about teen girls (it is awesome – you can still find some stuff I wrote for the blog while I was interning). I also did a great social media/blog research internship which actually ended up really helping my internship at Teen Voices – having a working knowledge of how WordPress works definitely gave me a leg up. Heading into spring of my senior year, I had a great grounding in how a small magazine runs and operates, but processing all the books we got in for review made me want to see what was happening on the other side. So I applied for NYU and Columbia’s Summer Publishing Course (also helpful in not having to find a job for a few more months! ), and ended up at NYU for the summer. I think what I took away from the program that I value the most, was an oversight of how the books side of things work, and what happens before those books go out in mailers with letters from the editor – I really didn’t have any idea before I got there. And my resume got tidied up a little bit too – which never hurts. I was also able to definitively say I did not want to work in the editorial department, which – trust me – set me apart from a lot of other interview candidates. I ended up at Workman at the end of September to work on Marketing, Publicity, and Special Markets for 1,000 Places to See Before You Die (this book is amazing. trust me, I’ve legitimately looked at every page. multiple times). I was somewhere in limbo between intern and real employee – I worked full-time but was paid hourly. I didn’t end up with the position through an NYU posting, although this was sent around to SPI alumni, but rather from another interview with someone else at the company who referred me. This was a great crash course in how these departments work at a midsize publishers. I was doing everything from letters for mailings to tweeting to databasing every single US location mentioned in the book (there are over 1,000, in case you’re wondering). After the assignment for 1,000 Places, I was lucky enough to stay around working for Gift Sales (remember that other interview – it was my boss in Gift Sales) and Special Markets, while I hunted for a full-time offer. Long story short, I am at Workman still, in Gift Sales, after getting an offer from another company that spurred a counter-offer from Workman. I wouldn’t say any two days are exactly alike for me. My department, Gift Sales, deals with selling books to places that do not traditionally sell books, from stationery stores to actual gift stores, and cooking stores to children’s stores. We are a small department, so I help everyone out with a variety of things. On any given day, I could be finding item numbers and placing orders, talking to our sales reps, working on various special projects (dealing a lot with trade shows), sending samples to existing accounts to boost their business with us, and running reports so that we can send target mailings to specific types of customers. Dear Indie Presses: Claire Lawrence’s Book Will Knock Your Socks Off!